DDR2 SDRAM. INCLUDES: Unit Only. Whether it's a laptop, desktop, LCD, printer or one of our other amazing deals, each piece is coming to you off-lease. As such, while the physical condition of the machine may feature small scratches or blemishes, each piece is in good working condition, ready to provide you the best experience possible. 4GB SET - LOT OF 4 PIECES. We want you to be satisfied with your selection but we have NO responsibility for selection errors. 1GB 1RX8 DDR2. 4GB SET - LOT OF 4 PIECES. We want you to be satisfied with your selection but we have NO responsibility for selection errors. Dell Optiplex GX280 Mini-Tower. 4GB Total. 4 Pieces of 1GB 128M X 64 Non-ECC 533MHz PC2-4200 240-pin Unbuffered DIMM (DDR2, 1.8V, CL5, Gold Leads). 100% compatible with 800MHz versions of many systems including . 1GB 2RX8 DDR2. 4GB SET - LOT OF 4 PIECES. We want you to be satisfied with your selection but we have NO responsibility for selection errors. Each stick is 1GB of ram. More tech info in pics and below. 4GB (4x1GB) DDR2 667MHZ 240pin Low Density DIMM. Dell Precision Workstation 380 Workstation 390. Dell Optiplex 745C 745 Ultra SFF 755 Ultra SFF GX320 GX620 Ultra SFF GX755. Dell Inspiron 545s 531s 546s. 4 X Mushkin Essentials 1GB PC2-6400 5-5-5-12 1.8V. 1GB 2RX8 DDR2. 4GB SET - LOT OF 4 MATCHING PIECES. We want you to be satisfied with your selection but we have NO responsibility for selection errors. 800MHz Speed Product Features. Speed: 800MHz. 1GB Stick (4x). Capacity: 1GB. Compatibility: Desktop. Samsung OEM. No Software CDs, Heatsink, PC, Chassis, Manuals are included. Wide range of Products. 1GB 1RX8 DDR2. 4GB SET - LOT OF 4 PIECES. CRUCIAL # CT12864AA800.8FG. We want you to be satisfied with your selection but we have NO responsibility for selection errors. Dell OptiPlex GX620 DT / MT / SFF. 4GB Total. 4 Pieces of 1GB 128M X 64 Non-ECC 667MHz PC2-5300 240-pin Unbuffered DIMM (DDR2, 1.8V, CL5, Gold Leads). Dell OptiPlex GX620 Ultra Small Form Factor. WILL WORK IN 667MHZ SYSTEMS ONLY. 4GB Total. 4 Pieces of 1GB 128M X 64 Non-ECC 667MHz PC2-5300 240-pin Unbuffered DIMM (DDR2, 1.8V, CL5, Gold Leads). WILL WORK IN 667MHZ SYSTEMS ONLY. 100% compatible with 667MHz versions of many systems including . Pulled from a working computer. Very clean, like new. Tested. Free ground shipping to 48 states only. 4GB Total. 4 Pieces of 1GB 128M X 64 Non-ECC 533MHz PC2-4200 240-pin Unbuffered DIMM (DDR2, 1.8V, CL5, Gold Leads). WILL WORK IN 533MHZ SYSTEMS ONLY. Dell Precision WorkStation 380. Dell Inspiron 546s. Dell Inspiron 545s. 4GB Total. 4 Pieces of 1GB 128M X 64 Non-ECC 667MHz PC2-5300 240-pin Unbuffered DIMM (DDR2, 1.8V, CL5, Gold Leads). WILL WORK IN 667MHZ SYSTEMS ONLY. 100% compatible with 667MHz versions of many systems including . DDR2 800 (PC2 6400). 240-Pin DDR2 SDRAM. 4GB (4 x 1GB). Heat Spreader. CAS Latency. 4GB Total. 4 Pieces of 1GB 128M X 64 Non-ECC 800MHz PC2-6400 240-pin Unbuffered DIMM (DDR2, 1.8V, CL5, Gold Leads). 100% compatible with 800MHz versions of many systems including Dell Inspiron 518. 4GB Total. 4 Pieces of 1GB 128M X 64 Non-ECC 533MHz PC2-4200 240-pin Unbuffered DIMM (DDR2, 1.8V, CL5, Gold Leads). WILL WORK IN 533MHZ SYSTEMS ONLY. Dell OptiPlex 700. Dell Optiplex 740. Dell Optiplex 745. 4GB Total. 4 Pieces of 1GB 128M X 64 Non-ECC 800MHz PC2-6400 240-pin Unbuffered DIMM (DDR2, 1.8V, CL5, Gold Leads). WILL WORK IN 800MHZ SYSTEMS ONLY. 100% compatible with 800MHz versions of many systems including . 4GB Total. 4 Pieces of 1GB 128M X 64 Non-ECC 533MHz PC2-4200 240-pin Unbuffered DIMM (DDR2, 1.8V, CL5, Gold Leads). WILL WORK IN 533MHZ SYSTEMS ONLY. Part # VS1GB667D2. (4) 1GB MODULES, 4GB TOTAL. ECC Fully Buffered DIMM. 1GB PC2-4200F. What is Shown in the Pictures is What You Will Receive. 4GB Total. 4 Pieces of 1GB 128M X 64 Non-ECC 800MHz PC2-6400 240-pin Unbuffered DIMM (DDR2, 1.8V, CL5, Gold Leads). 100% compatible with 800MHz versions of many systems including Dell Optiplex 160. 1GB DDR2 2RX16. 4GB SET - LOT OF 4 PIECES. Product: LAPTOP. We want you to be satisfied with your selection but we have NO responsibility for selection errors. Form Factor: 200 pin. Dell Optiplex 745. Dell Optiplex 745 MINITOWER. Dell Optiplex 745 Small Form Factor. Dell Optiplex 745 Ultra Small Form Factor. 4GB Total. 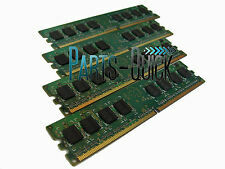 4 Pieces of 1GB 128M X 64 Non-ECC 533MHz PC2-4200 240-pin Unbuffered DIMM (DDR2, 1.8V, CL5, Gold Leads).